Brighton shrugged off the dismissal of Shane Duffy to ease to a 3-1 home victory over rivals Crystal Palace. The defender was given a straight red card for thrusting his head into Patrick van Aanholt’s, with Brighton 1-0 up through Glenn Murray’s penalty – but Leon Balogun and Florin Andone then found the target to secure all three points by half-time. Although Luka Milivojevic pulled one back from the penalty spot, it did not stop Chris Hughton’s team moving into the Premier League’s top 10. However, Roy Hodgson’s side remain only three points above the bottom three. A clumsy challenge by James McArthur on Jose Izquierdo, as Palace struggled to clear their lines and Aaron Wan-Bissaka and Milivojevic comically collided, gave the hosts a 24th-minute penalty. Murray, who has repeatedly given Palace cause to regret his sale in 2015, calmly sent his eighth goal of the season towards the top right corner, and Brighton swiftly pursued a second. 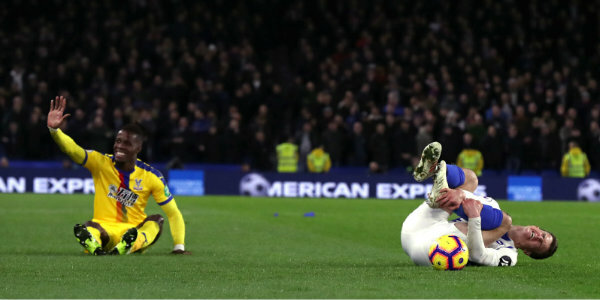 With Murray hurt after a challenge by James Tomkins in the course of conceding a corner, near the watching referee Kevin Friend, Duffy confronted Van Aanholt – who regardless appeared to exaggerate the contact made and watched as the defender was sent off. The injured Pascal Gross was then replaced by Balogun, and when Solly March’s 31st-minute right-wing corner was headed on towards him, with his first touch the substitute struck powerfully on the turn from in front of goal, beyond Wayne Hennessey and into the back of the net. Milivojevic threatened for Palace when, at 2-0 down, they could still have made their numerical advantage count but saw Bernardo clear his goalbound shot off the line, and defeat looked inevitable when the hosts made it 3-0 just before half-time. In first-half added time, Bernardo sent the ball upfield and substitute Florin Andone, appearing to chase a lost cause, collected possession on the left, sprinted towards the area beyond Tomkins, cut inside on his right foot and produced an angled finished to extend the Seagulls’ lead. A quieter second half ensued, with Brighton a man down and Palace continuing to struggle in the absence of the focal point provided by a consistent orthodox striker and goalscorer – Wilfried Zaha and Andros Townsend were again up front. It took until the 81st minute for Palace to get the goal they perhaps had earned, and unsurprisingly again owing to Zaha’s influence. Drawing a foul from Yves Bissouma, Zaha earned Palace a penalty, and the reliable Milivojevic powerfully finished into the bottom right corner beyond Mat Ryan to score what proved only to be a consolation. Be the first to comment on "Palace beaten by 10-man Brighton"